#6 - DeSoto National Memorial - View the Manatee River through the eyes of its earliest residents. Go to the DeSoto National Memorial to learn more about the Native Americans and Spanish Explorers who claimed their land for Spain. #7 - Hit the Beach - You have to see the beaches of Sarasota. You cannot go wrong with any of them. Siesta Key beach was recently named the #1 beach in the country by Dr. Beach. Don't be afraid to get sandy on Longboat Key, Lido Key, Turtle or Nokomis beaches. They are gorgeous as well. #8 - Find some Shark Teeth - Visit the "Sharks Tooth Capital of the World," down in Venice/Englewood. This is a great chance to collect some fossils from Caspersen Beach in Venice to Manasota Beach in Englewood. Your kids will love it. #10 - Pastry Art - Yearning for some cinnamon, sugar and everything nice? Go to the "Best Local Coffee" voted by the readers of SRQ Magazine. Here you can find tasty coffee along with cannolis, fruit tarts, wraps and sandwiches. #11 - Enjoy Caviar from Mote Marine - I personall have not done this but I know a few who have indulged in this Sarasota-produced delicacy. It was served at former Florida Governor Crist's wedding. It is produced at Mote's Aquaculture Park on Fruitville Road. It is the largest circulating aquaculture research facility in the United States. #12 - Delightful Treats at Morton's Market - In the Southside Village west of the trail sits one of Sarasota's oldest grocery stores. Full of inspired ready-to-go gourmet dishes, fresh fruit and vegetables, cheeses from all over the world and shelves of specialty sauces, snacks and teas, Morton's Market is an epicurean connoisser's dream come true. #16 - Attend the Ringling International Arts Festival - Annually, the Ringling International Arts Festival is held in the Asolo Theater. The first event was hosted in 2009. The reception area of this theater is now used for the museum and for special events and performances. Information sessions and seasonal film series are also hosted by the museum. The Ringling International Arts Festival is a highlight of any Sarasota trip. #17 - Run a Half Marathon - The Sarasota Marathon has been going strong since 2005. The event has evolved from a full marathon to a half marathon because of lack of sponsorships. The race begins near the Van Wezel Performing Arts Center heads out over the John Ringling Bridge then north to the John and Mable Ringling Museum along U.S. 41 and then back to the Van Wezel Performing Arts Center through the Indian Beach and Sapphire Shores neighborhoods. #18 - Enjoy some Homemade Apple Lemonade - Sitting quietly on the south trail in a nondescript strip mall is Simon's Coffee House and Eatery. Although, I have not been there in a few months it is still a very tasty place enjoy a meal. The food and service are delicious. The fresh apple lemonade will perk you right up. #19 - Segway around Sarasota - Just about everyday I notice a group of people on a Segway tour through downtown Sarasota. They pass by my office on 100 Central. I have not personally done it. It seem like a great way to scoot around town. 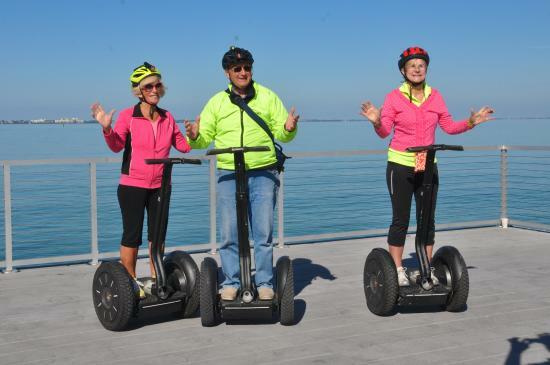 Florida Ever-Glides, the first company in the nation to offer guided Segway tours, conducts five tours a day in the city. #20 - Kayak around Lido Key - Feel like being one with nature? 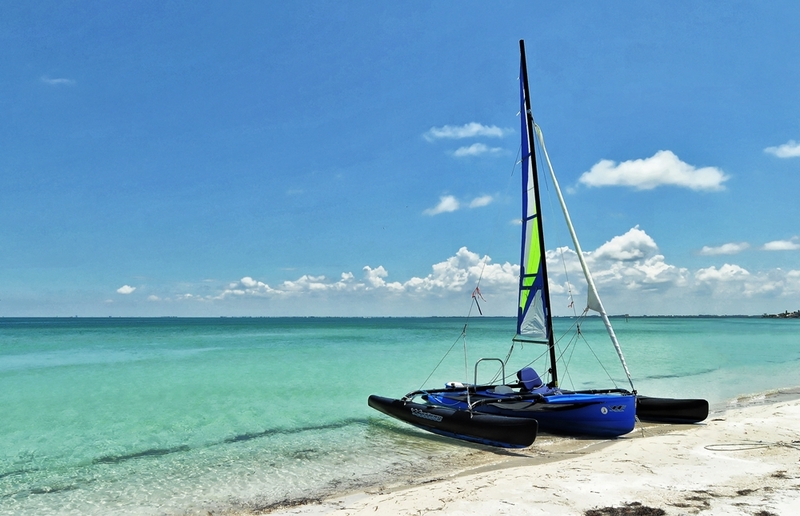 Put on some sunscreen, wear your bahting suit and take a trip on a kayak around the gorgeous south Lido Key park. This is a great way to see the beauty of this water. What a great way to see a dolphin, manatee, birds, and fish up close. Don't worry about owning a kayak. Almost Heaven Kayak Adeventures will rent you one. #21 - Roundabout and Park - Want to feel like you are in Europe? Take a spin through downtown's first roundabouts at the intersection of Central, Main and Pineapple adjavent to the newly renovated Five Points Park. Park your car and enjoy all of the amenities of downtown. #22 - Take in Some Comic Relief - In 2002 the Florida Studio Theatre Improv burst onto the scene. They rely heavily on audience participation. Here is a helpful hint - when the cast ask the audience for a location, don't name any of these three: a grocery store, a big box retailer or "the beach." the performers need a challenge and these are called out too often. #23 - Check out the Red Barn - Have you ever been to a flea market? If you like them run up to 1707 First Street East in Bradenton and visit over 600 booths in the Red Barn Flea Market. Shop, eat and take home some goodies. #24 - Mi Pueblo - If you need some tasty Mexican food visit Mi Pueblo. They have one on University Parkway, Bee Ridge Road and on U.S. 41 in Venice. Burritos, tacos, quesadillas and several other more authentic dishes. Personally, I prefer the food at the original location on Bee Ridge Road. #25 - Longboat Key Bike Ride - If you feel like enjoying the outdoors and getting a little exercise take a bike ride down Gulf of Mexico Drive on the gorgeous Longboat Key. Peddle past beachfront condos, gorgeous water views and waterfront homes. #26 - Jazz on 4th Friday of the Month - Between October and May St. Armands Circle gets busy on the 4th Friday of every month with Smooth Jazz on St. Armands Circle. Nationally known acts hit the circle to entertain the crowd. #27 - Fish in Tampa Bay - Head north to the Sunshine Skyway fishing pier. This is the old bridge that used to span Tampa Bay until the middle was demolished. 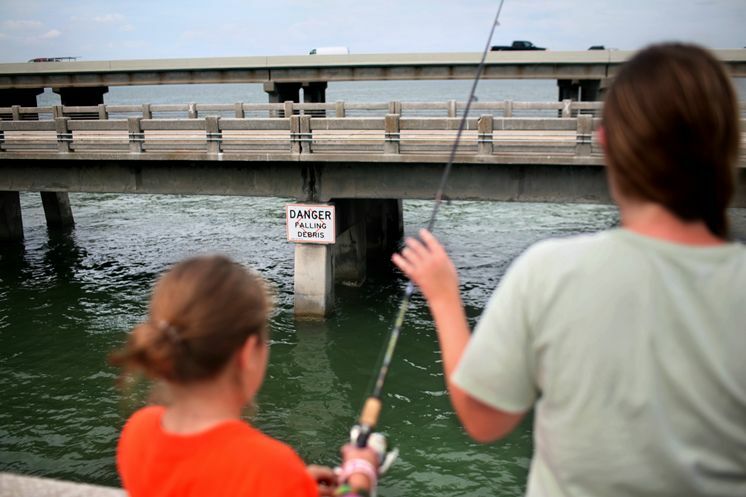 The concrete and steele rubble was strategically placed to form artificial reefs along both piers and offshore which attract a wide variety of species including Sharks, Tarpon, Kingfish, Spanish Mackerel, Grouper, Cobia, Snapper and Sea Bass. #28 - Enjoy the Beauty of Island Park - From Main street in downtown Sarasota head west towards Marina Jacks and the entrance to Sarasota Bayfront. Follow the tree lined walkway where yachts line the park. 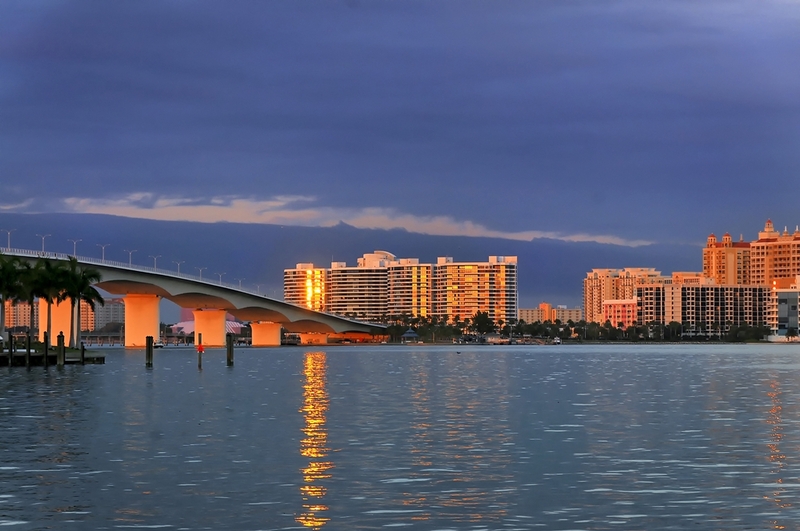 The park is frequented by happy people riding their bikes, walking their dogs, sitting on a bench or in the grass overlooking the beautiful Sarasota bay. There is even a play ground and water park for the kids. If you get hungry stop by one of Sarasota's landmarks - O' Leary's Tiki Bar and Grill. This is a great place to grab a meal and drink. #29 - Big Cat Habitat - If you enjoy seeing wildlife...big wildlife then go to the Big Cat Habitat in east Sarasota. This is a sanctuary for rescued exotic cats and other native and exotic wildlife in need of a permanent home. Big Cat Habitat provides education to the public to foster appreciation of the animals and impart the importance of habitat preservation. #30 - Sculptures in Downtown Sarasota - Take a look at the "Intersections" public art project in downtown Sarasota. It features sculptures from 12 artists spread out over the downtown shopping districts. #31 - Take in an Indie Film - Do you like indie or foreign flicks? Head over to the very noticeable pink building in Burns Court. It offers indie and foreign films for those looking for something a little different. Visit filmsociety.org to see what is playing. #32 - Sarasota Hot Yoga - Challenge yourself and do some hot yoga. Essentially, it is yoga practiced in a room where the temperature is from 95 to 105 degrees. You will be amazed by this work out. I have done it (although not enough) and highly recommend it. Visit bodyheatsarasota.com for class schedule.